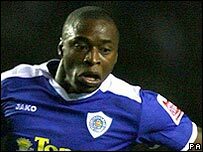 Midfielder Shaun Newton has left Leicester City by mutual consent. Former Charlton, Wolves and West Ham winger Newton, 32, joined the Foxes on loan at the end of last season and made his move permanent in the summer. But he has been unable to hold down a regular spot and has made just seven league starts for the club this season. He becomes the second player released by City boss Ian Holloway in four days after striker Carl Cort also agreed to have his contract terminated on Friday.